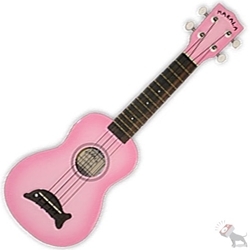 The pink burst gloss MK-SD/PKBRST from Kala is an entry-level Makala Series (Dolphin) Soprano Ukulele that has an agathis wood top, a mahogany neck, and a rosewood fingerboard and custom bridge. It can be used for several applications by musicians and students in recording studios, rehearsals, for playing at home, and more. The MK-SD/PKBRST has a powerful sound. The injection-molded body of the ukulele is built with 12 brass frets, and has geared tuners to ensure the instrument stays tuned. Featuring a custom dolphin bridge, this instrument looks great and is appropriate for the beginner or professional performer. A nylon carry bag is also included.